Background: The term “ploidy” refers to the number of copies of the genome contained in a cell. Many eukaryotic cells (including plant and animal cells) are diploid (ploidy = 2), having one copy of the genome from each parent. Interestingly, many cells in plants have more than two copies of the genome (ploidy = 3, 4, 8 etc. ): these cells are called “polyploid”. 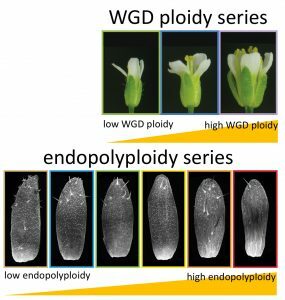 Polyploid plant cells sometimes arise via whole-genome multiplication (WGM), which increases ploidy in every cell in the plant body. Plants that have undergone WGM are often observed to be larger and to have greater vigor. Individual cells within a tissue can also become polyploid: this occurs via endoreduplication, a specialized cell cycle that multiplies the genome and bypasses cell division. Cells that have undergone endoreduplication are often very large relative to the surrounding cells. Questions: We wanted to understand how ploidy and size phenomena are related at several biological scales. To investigate this, we created two ploidy series in Arabidopsis: one that progressively increased in WGM ploidy (diploid, tetraploid, and octoploid plants; ploidy = 2, 4, and 8 respectively), and another that progressively increased in level of endoreduplication. We measured nuclear volume, cell area, cell number, and organ size in sepals of these plants. Findings: We found that size generally scales up with ploidy, but that compensation phenomena dampen the magnitude of change. In the WGM ploidy series, cells are about 1.7 times bigger in tetraploid vs. diploid and in octoploid vs. tetraploid sepals; however, the total size of the organ changes less dramatically (about 1.2-fold), largely because sepals at higher ploidy have fewer cells. We also found that nuclear size and cell size are correlated by a fairly constant ratio, but that cell size likely scales to cell ploidy rather than to nuclear size. Interestingly, sepal size did not increase across the endopolyploidy series: average cell size increases about 5-fold, but sepals with larger cells have far fewer cells. 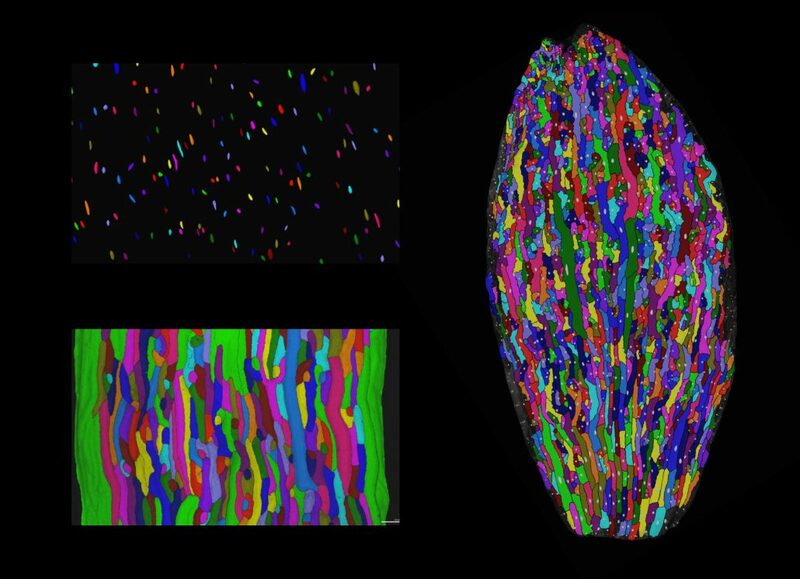 Next steps: Our research suggests that an active scaling relationship links cell size to cell ploidy. 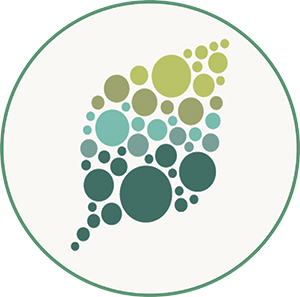 We’d like to find factors involved in this process by screening for mutant plants in which nuclear size and cell size become uncoupled.